chicken | Grow family. Grow! Just this week Los Angeles banned single plastic bag use, joining cities and towns across the country. Tucson has been thinking about how to address issues associated with single-use plastic bags. Me? When you’ve the opportunity to use sweet canvas bags like this one my mum gave me there isn’t a question. Brilliant. 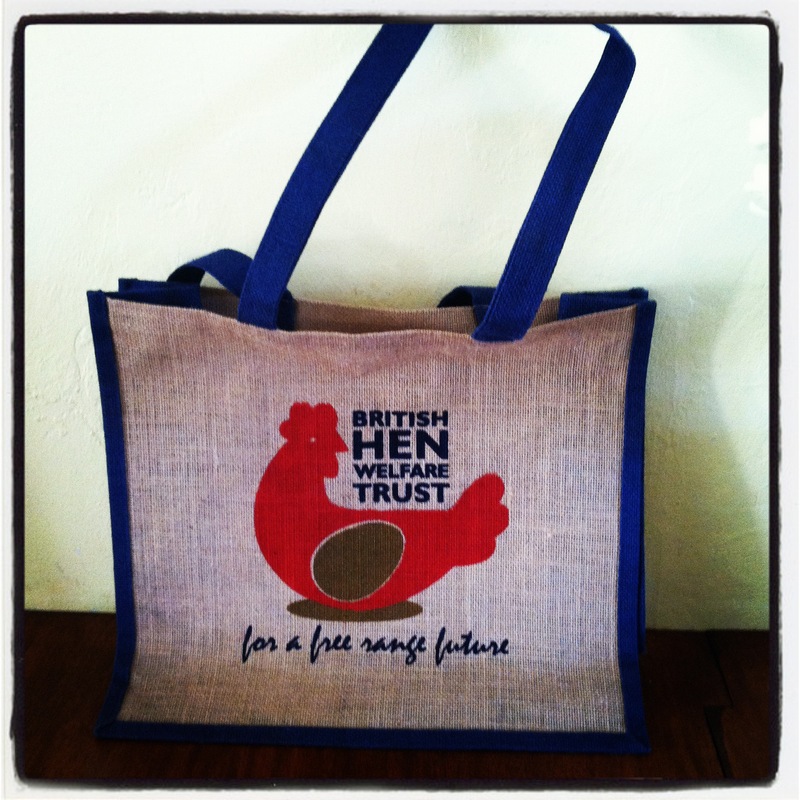 Every time I look at it though I see “In Hen We Trust” not British Hen Welfare Trust. Not sure why. Hey, but check ’em out. This upcoming Friday is Free Range Friday. We should celebrate! I’ve got some adoption thoughts brewing, but waiting to have a moment to actually process them and so this is what we’ve been getting up to. 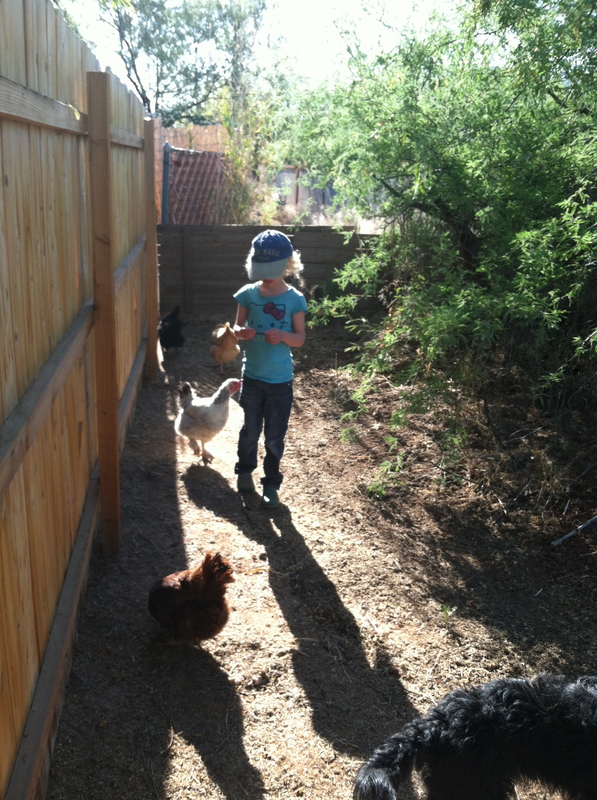 Bean and the hens weeding the easement. Well, maybe that should be encouraging the hens to weed the easement. They need to earn their keep damn it. I’m thinking we should have an easement party, perhaps a Jubilee easement party, complete with bunting and sarnies. Sounds like a fab idea don’t you think? Maybe a big bowl of quivering trifle (I hate trifle, something about all those textures mixed together, but it is appropriate street party food for the Jubilee.) I think I’m going to invite all the neighbors. Do you think they’ll know why it’s a Jubilee Party? Will someone be offended? Perhaps they’ll throw a Boston Tea Party. Where are you going to put those hens in the desert? Apparently, for us it is in the Palais de Poule aka Hen Palace. Seriously, this thing is large enough to accommodate our dozen hens and a family of four. Okay, maybe not the family of four, but certainly a little craft room for me. Our hen house is a veritable palace. Those chickens live in the lap of luxury. Perhaps Will and Kate might want to move from that cozy cottage near Anglesey to the Palais de Poule? First things first. What are you going to build? We used a plan from mypetchicken.com and expanded on it. The original plan was for a hen house about half this size. There are loads of plans out there and according to Green and his dad who are well versed in such matters, the one from My Pet Chicken was straightforward and easy to adapt. And for desert dwelling chickens, adapt it you will. Location, location, location AND orientation. Important in real estate and of course, chicken coops. Now if you have a yard the size of a postage stamp then there might not be much discussion, but we live right in the middle of town in an area that actually has relatively large lots. Check out my fancy architect impersonation. Totally at all to scale. We placed our coop on the east side of the yard. It runs length ways, north to south. What you need to consider: In the summer is this going to be a home for my chickens or a boiler? We’re lucky, we have a fair bit of shade thanks to trees in the yard, so that the afternoon sun which pours in the west side of the coop isn’t horrible, but we also help cool the area off with shade cloths, misters and bottles of ice (I’ll share more about that another time). If we were to do it again, I think we’d move the clothes line and shift the coop further into the shade of the mesquite at the back of the yard. 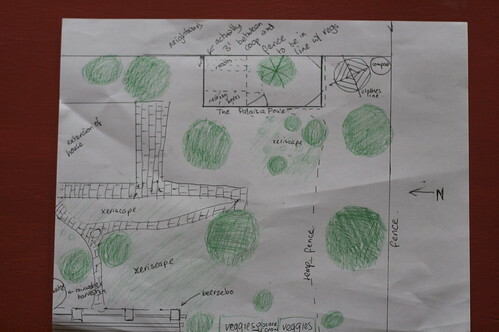 As it is, we have trees growing that will provide substantial shade within the next few years. Where in your yard would you get good summer shade? To run it north south or east west? I question the wisdom again of having the afternoon sun shine along the long side, but what is of more concern is the aspect of the nesting boxes. Check out the picture again. See, the nesting boxes are right there on the north west side of the coop? Nice little cooking crates for both eggs and hens. Make sure your nesting boxes are located on the North East corner of your structure in a nice shady area. When one of our Buff Orpingtons was broody this summer I worried constantly that I was going to find baked chicken in the coop one day. 3. 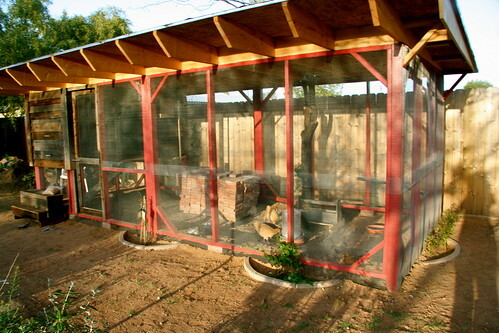 Consider adding one of those twirly vent thingees (rotary attic vent) to the top of the actual coop area. No matter the orientation or shade, that coop is going to be hot in the summer. A vent will eleviate some of this I imagine. We’re going to add one to our coop. 4. We extended the roofing beams to provide more shade, and actually covered the run unlike the plans which show a translucent roof for lots of light. I figure we have excess of light here in the desert. No worries about them getting enough, plus our ladies get to free range it for a fair bit of the afternoon. The thing with light is that the length of day does impact egg production. It hasn’t effected our egg production though I think. If I think of anything more I’ll share. I’m sure there is a really cool adobe hen house you can make, we just didn’t. So you want to keep chickens in the desert? Before we go any further I have to mention the fabulous chicken photo above. My friend Melissa Haun took the picture (hence the stamp). Melissa got her first fancy camera not long after I got mine, but she actually invested in classes and trainings and countless hours practice. It shows. She is moving to the big leagues soon. 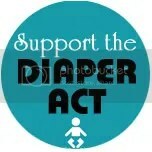 Check out her site. 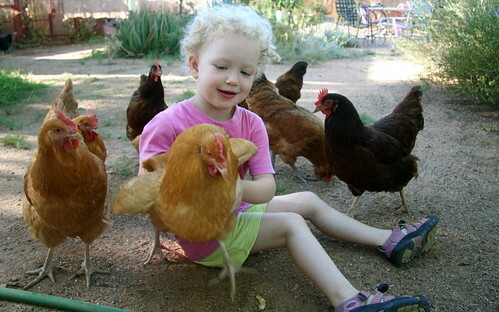 Leah asked a few weeks ago about tips for raising chickens in the heat of the desert. Given we’ve only been doing this since January we’re hardly experts, but now it is September we’ve at least made it through the summer. Well, almost. For those outside of Tucson, it is still bloody hot here. I can’t pretend expertise, but I can share what I would do different or the same if we were to do it again. Most of the information I’ve gleaned has been from the Backyard Chicken Forum, My Pet Chicken and Mykl Wells aka not completely random guy in bar, who I know through Crafternoon. The first installment: Really? Chickens? 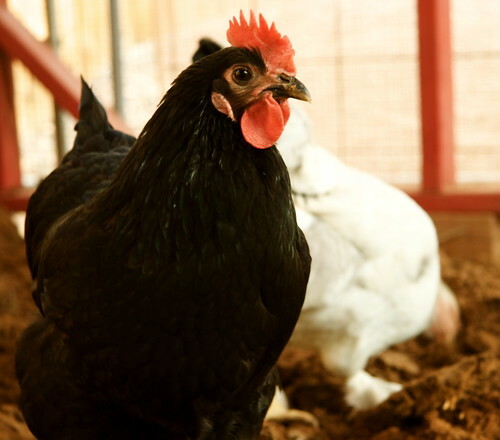 The appeal of fresh eggs in the morning, especially after the recent salmonella scare, the increased awareness of dire factory farming practices, and the whole back to the earth movement has a lot of us checking out backyard chickens. Our discussion about keeping chickens started seriously a couple of years ago after house-sitting for some friends in Marin, CA who had five chickens. Along with fabulous fresh produce, we were in a gastronomic heaven. Green grew up partly on a farm, so the idea had a lot of appeal for him, and I’m a push over about such things so it didn’t take much. We visited our friends in CA again this past March, and along with some more local friends doing the urban chicken thing and talking with our neighbours who keep chickens we finally bit the bullet and got some chickens. It has been incredibly rewarding so far. One of the first things I do every morning is check out the chickens, or chooks as those wacky Australians refer to them as. Feed them, check their water, clean the coop (okay not every day on this, but often). When we get home, I rush to see how many eggs they’ve laid, and to let the chickens out to play in the larger yard. I love how they cluck at the gate as soon as they see me in the morning and how Snow White (What can I say? We have a 3.5 year old kid in our midst.) follows me around the yard. The eggs are almost as rewarding as just having them with us in our home. Of course, you could just get friendly with someone with a backyard chicken addiction. Next time: What hen? That hen. Oh Liesl, you darlin’ hen. Thank you. Now we can have green eggs and ham. The hens are starting to lay, despite the crazy heat. 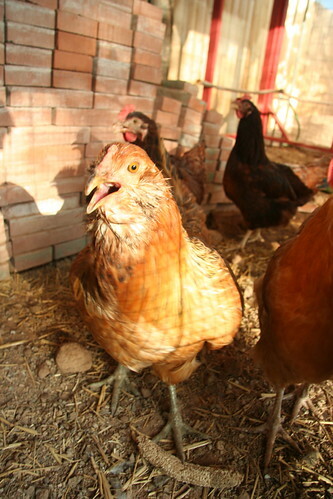 So far, Dumpling, Rosy and Lucy (our Rhode Island Reds), Gretchen, and now Liesl, have all laid eggs. This week we’ve typically had 4 eggs a day. 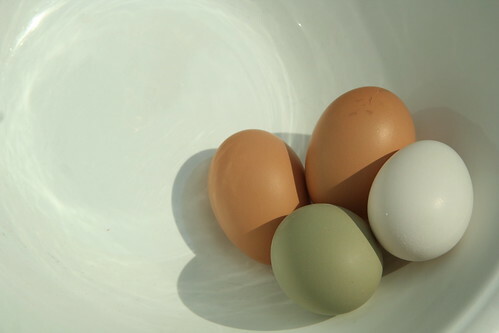 Gretchen’s eggs are short, squat, almost spherical and a beautiful deep brown; Dumpling’s eggs are stark white; Rosy and Lucy each a typical beige number. The thing is you can tell which hen laid the eggs, and not just by the color. 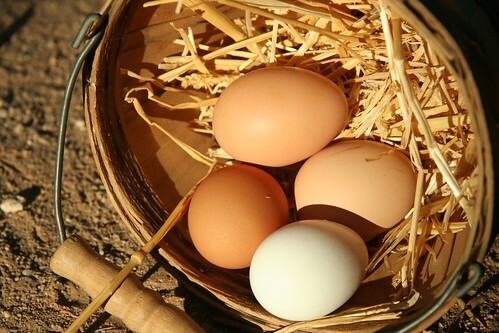 The eggs have different shapes, as if the chickens each have differing rates of laying. Like the head of a baby delivered vaginally, the egg may be super pointy if it took it’s merry ol’ time or decidedly flattened and round if it just barreled through. Hmmmm, that sounds familiar. The other thing about the first egg, is that several have been pecked. I think that after laying their first egg, they turn around and peck the egg just to see exactly what all the fuss was about. So today’s introduction: Liesl protesting the lack of monsoon. I must say I agree. 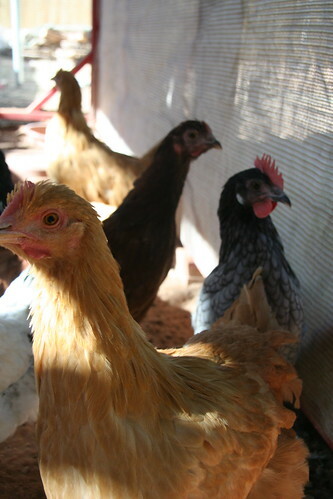 In response to a couple of requests for more chicken introductions on the blog. I thought I best introduce you quick. There might not be another chance. If Dumpling turns out to be a ‘he’, rather than a ‘she’, his future is rather shaky. No roosters allowed inside city limits. So what do you think? We’re taking bets. I’m guessing this is one of my fav artists, Nikki McClure, doing the artwork on the cover of this sweet looking cookbook by Cynthia Lair. Right? New Urban Habitat is doing a giveaway of the book on her blog. I’m all over that and if I can’t win it, how about you? By the way I’m feeling very new urban suburban this weekend after adding three more chicks to our backyard flock. Well, not exactly to the gaggle of hens we already have. Those hens are enjoying the Chicken Palace aka McHen House now and are no longer stinking up our mud room. The three new ones are just a few days old, a couple of black Australorps like our friend’s K and G’s and a light Brahma. Sweet. Or maybe that is crazy. Yep, probably crazy. Perhaps this cookbook has lots of egg recipes in it? I think we may get a little tired of omlettes and quiches. Well, we have another few months to worry about it before actually having to face the onslaught of eggs. PS. A belated happy Spring Equinox. May you get plenty of sleep and feel well balanced in life.